Friday morning I had a followup chest xray and appointment with my doctor at Bangkok Hospital. After my third dose of radiation this month I learned that everything has cleared up nicely. No more antibiotics or other pills for the time-being. 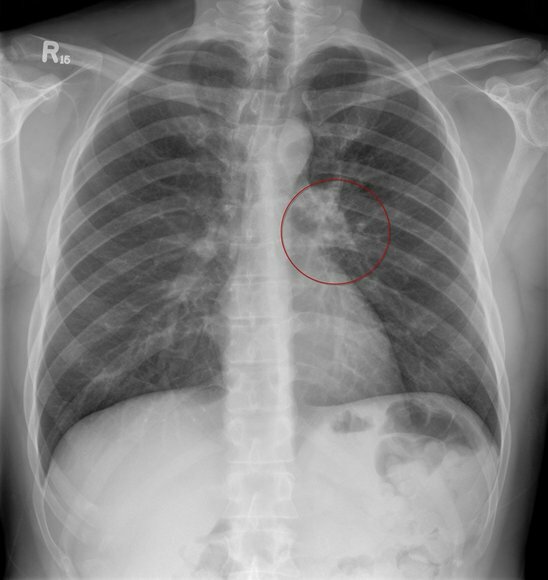 This xray shows my lungs at the start of the infection, the inflamed and congested area in the left lung indicated by the circle. How anyone can read these things is beyond me, but someone can and that’s the diagnosis they made. I had expected that my stay in the hospital, my first since being born, would have elicited some insights about mortality, death, the brevity of life, etc. I expected to sit down and write a few of the “open when you are 18” letters to my nieces with all sorts of nifty insights drawn from the experience of staying alone in the hospital. But, really, none came. Maybe I’m just deceiving myself. Maybe I’m just naive. But over the past decade I think I’ve already arrived at a realization about my own mortality. I don’t dwell on my eventual death, mind you, but I am very conscious that my life, and the lives of all those around me, will come to an end. The summer before I turned sixteen I lost the first of my four grandparents. My paternal grandfather had a protracted battle with what began as prostrate cancer (yes, I recognize that that is likely the battle for my life I’ll face and I do get screenings) and I cried deeply after losing him. The same thing happened with two of my early relationships. When they came to an end, I was devastated, too, certain that I would never love again. From all this, I’ve recognized the pattern. All things come into being, grow in maturity, age and decline and eventually die. People. relationships, possessions – it seems to be true of everything. And at some level I have made peace with that, so nothing new to report from staying in the hospital. Of course, I hold out the possibility that I haven’t really learned anything yet, that I am kidding myself when I think I’ve recognized and made peace with this reality that all things go away. This entry was posted in Uncategorized and tagged death, Hospital, impermanence by christao408. Bookmark the permalink. It’s good to be at peace with death. So many are petrified by it. I can relate. I’ve been a pall bearer for a colleague of mine, I’ve watched my aunt passed away in front of me and my mom passed away a few years ago. I won’t say I’m at peace with my mortality – it’s inevitable and the final fact of life. I don’t dwell on this either – although some days I think about it more than I should. Gosh Chris, you really felt miserable with a very small patch of pneumonia. You should have posted the ‘post’ abx therapy xray. Then everyone could have seen and read the changes.I think we all go through those moments of introspective eventualities of life. The older you get, the more you philosophize about them. But then you begin to think, “ah well, another day that I am vertical, ( as opposed to being horizontal on a bed or stretcher or a slab!) and so life goes on. I think I have made peace with death as well, but like you said- perhaps I am just kidding myself. I don’t know. I have seen so many death in the family and I also subscribe to the belief that death is not the end, but rather the beginning of another journey. Dust in the wind. We are all dust in the wind. This seems connected, in a way, to a post you made a month or two ago (I can’t recall exactly when); about how life is too short to be angry. When I read that, I was actually during a time when I was angry and it calmed me down and made me realize you were right. I don’t know if I’ve truly faced my death. I’ve almost died many times, and so I know my life is just going to end some day, at any moment almost. I don’t know why I don’t contemplate it more. Glad to hear you are on the road to recovery. What i learned is 1. health 2. family 3. work is the order of priority. I think that a lot of people are never at peace with the thought that most things do eventually come to an end in some way, shape, or form. It’s good to realize that I think. It makes a lot of things so much easier to be at peace with. I may not be dealing with death exactly, but life is still complicated. This has calmed me some. Thanks. Love that your posts tend toward the thoughtful. I think about death quite a bit, with different emotional reactions; sometimes I think I only handle it in pieces. I try to prepare myself mentally, but I tear up when I really think about my parents going, or my siblings. I had a similiar non-revelation with my near-death and hospitalization in the spring. It’s weird to feel nothing sometimes. @ElusiveWords – When I wrote this entry, Matt, I hesitated for several minutes before posting it, precisely because I knew you would read it and, not having lost a parent or a child, I’m not sure I have the authority to speak about how much or how little I’ve come to terms with the truth of mortality. I had you and the loss of your mother in mind while I wrote. Just want you to know that. @Wangium – Proof that you are dorkier than me: I have no idea what you are talking about Jason. @everyday_yogi – The radiology department provides for free, upon request, a CD with your xrays and copies of the radiologist’s report. In fact, my CD contained all the xrays on file with the hospital including those from the last dentist’s visit. An unexpected surprise! @ZSA_MD – I was going to post the after xray but it was difficult for me to make heads or tails of it. This one was a little clearer. @arenadi – I’m glad you found some impact from the entry. Despite the appearances, there are actually some underlying themes to this blog. =D@chrispycrunch – I might move work a few more pegs down and add some things before it. @choyshinglin – And on a rainy day, mud. @TheCheshireGrins – The more our society insulates us from death (of people and of animals) the less we can appreciate the natural cycles, I think. @epiginoskete – Thanks for your comment. “Tends towards the thoughtful” can also be interpreted as overly navel-gazing. =D@secade – Certainly, those types of experiences open a door for vivid realization of mortality. @swimminglibra – You’re welcome. @Dezinerdreams – If death was such a bad thing, fewer people would do it. @stebow – I’m trying…@yang1815 – How do I respond, Andy? I can totally relate to this. I’m acutely aware of the mortality of everyone and everything around me, and even though I don’t dwell on it the thought is always in the back of my mind that someone or something important to me may not be there tomorrow. I think it’s actually a comforting thought to at least be able to aknowledge nothing is forever–this way we appreciate what is there. @christao408 – Haha sorry Chris. My “awesome” comment referred to the fact that you have your Xray to post!Many things in life comes in a cycle, good or bad. And I think many of us have accepted that fact and don’t react much to it while some others aren’t the same way. Thank you Chris… you write from your heart so just keep doing that and don’t worry about moral authority. Glad you are ok! stay well, my friend. @stevew918 – Thanks, Steve. How is your trip going? @ElusiveWords – That’s very nice of you to say, Matt. @yang1815 – Awesome… =D@lil_squirrel4ever – That’s true, hopefully an awareness of mortality helps us better choose how to spend the time that we do have. Loss is always difficult, regardless of how well one thinks they are prepared for it. It means change, facing an unknown circumstance, doing without someone, something dear to us. @christao408 – Nah, not navel-gazing. Just pleasantly pensive. @brooklyn2028 – Really? Anything in particular spark it?